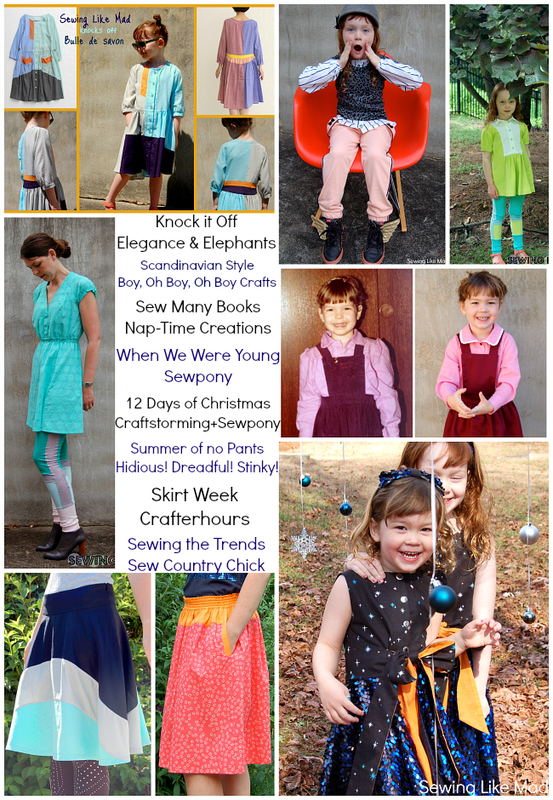 Sewing Like Mad: Good bye 2013. Hello 2014! 2013 was my first full year with a blog. It was also the year where I tried to live out my blogging dream and realized it was not what I dreamed of. Or let me specify.....if I had all the time in the world I would be the happiest lady in the world. 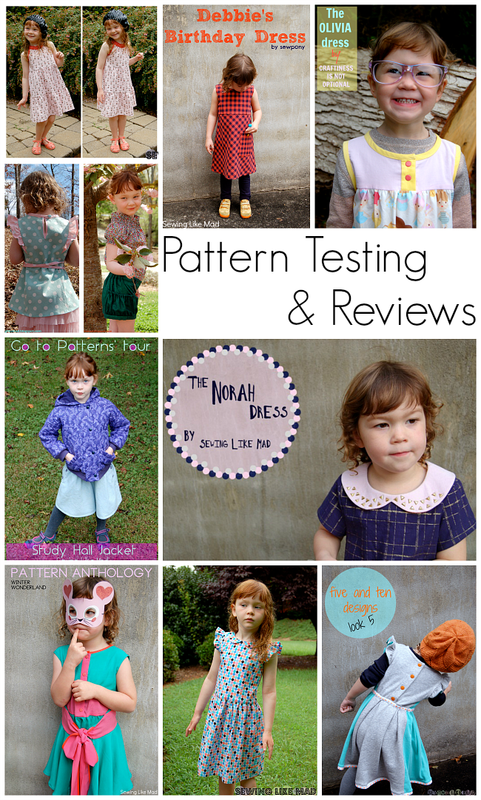 When I started my blog in spring 2012 I enviously followed other blogs that participated in competitions, series and pattern testing or tours or did their own series. This year I got to do all those things....and it was fun, really! But....like with so many other things in life....everything in moderation. I had the luxury problem of getting so many amazing and exciting offers and requests, and I was like a kid in a candy store, saying yes to them all. The result was of course that I ended up being way too busy and I did not have time to enjoy the ride. And since this blog is still mostly a hobby thing for me there is really no need for that much stress and Mommy guilt. So what are my plans for a less stressful 2014? I will tell you in the end of the post. A LOT of good things did come out of this year's craziness though. A ton of new and good friends. A lot of practice with photography, editing and graphics - improving is always fun! I will certainly keep working on that in 2014 since there is plenty of room for improvement. Oh, and a ton of posts of course. Let's take a look at some of the things that has been going on, shall we! Above is a recap of the series I have participated in this year. After I finished the photo collage I realized that I forgot one - Flip This Pattern at FrancesSuzanne. You can see it HERE. Participating in another blogger's series is always fun and it definitely pushed me to do some of my best work because, well, it is not just going on my own blog. In June did the lovely Jess from Me Sew Crazy gather a contributing 2013 Sewing Rabbit Creative Team and I was lucky to be selected together with 7 other AMAZING ladies. Every month did we each contribute with a tutorial on her blog. I can't even begin to explain how much it have meant to me to meet Jess and the other ladies on the team and how much I have learned making these tutorials every month. But having that deadline over my head every month was definitely also stressful for me. I wish I was more relaxed with deadlines, ugh! I am determined to keep up doing tutorials but maybe not huge ones every month. A click HERE will take you to my tutorial page which will have the links to each post/tutorial. The new 2014 Sewing Rabbit Team is being introduced one of these days so keep an eye on Me Sew Crazy. And then when things were really busy I got an offer I could not say no to.....Project Run & Play, season 7! 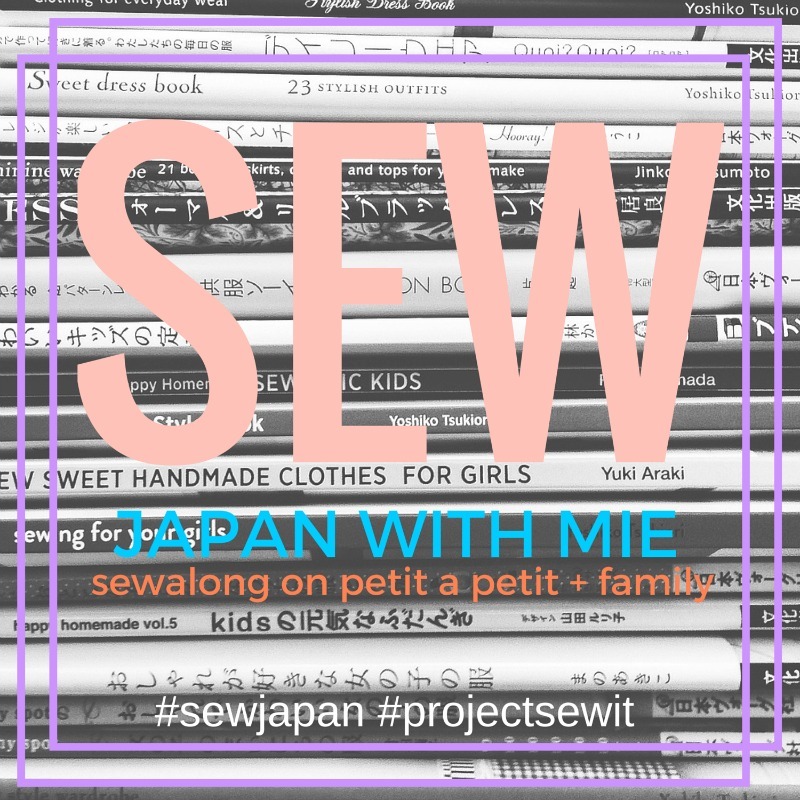 Holy smokes, that competition was the way I discovered this community of sewing blogs and even though I was not sure how I would fit in, I was certainly ready to give it a go. I am sort of a competitive person, understood in the way that when I decide to do something I give it my all....and when I give it my all, I also want to be rewarded...as in win, ha. Anyone else know that feeling too? Participating was a bit of an emotional roller coaster - mainly because of my own expectations - but I made it to the finale, ended up as number three and is overall very proud of the products I put out there. I made some amazing friendships along the way, existing friendships got stronger, learned a ton of new things and I got LOTS of help and support and honestly I am not sure I would have made it through without. HERE is the link to all the individual posts. I organized my first blog series this year. That idea might have been inspired by the fact that my oldest daughter started Kindergarten this year, ha. 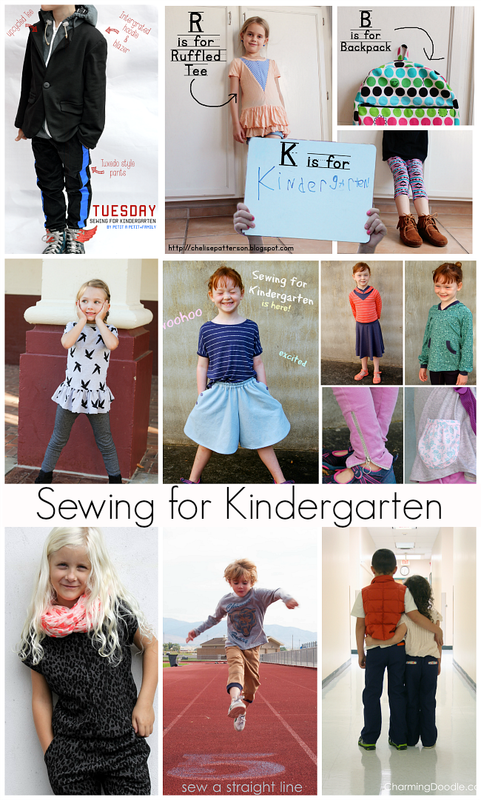 So I gathered a bunch of talented bloggers that all had kids starting in Kindergarten this summer and they all showed us what they had made them for their school start. So fun. Links to top row posts: Petit a Petit & Family, Chelise Patterson. Middle row: Girl.Inspired, Sewing Like Mad. 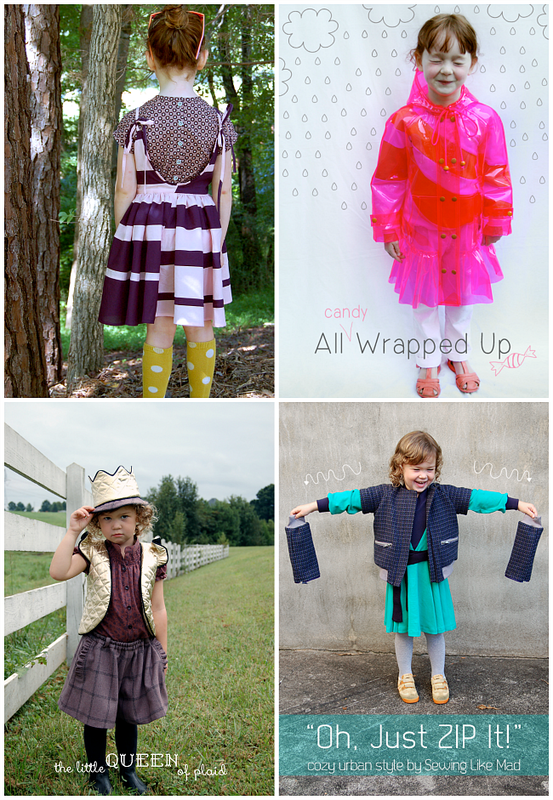 Bottom row: Groovybaby...and Mama, Sew a Straight Line, Charming Doodle. I did not have room to show them all here but I can guarantee that they were all amazing and you can find links to all the posts HERE! I also arranged a sew along divided into three groups, preschool, elementary and middle/high school. You can see the winners of each group HERE. I was also lucky to be invited to test patterns and participate in pattern's release tours. It is always an honor to me to be chosen to do these things. Testing because well the designer trust the testers' ability to find any mistakes before the release. And the pattern tours because the designer is interested in seeing your version of their pattern. 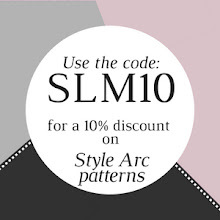 There is a lot of talented pattern designers out there as you can see above. Most of the photos have a title with their info. But here is the info to the ones without. 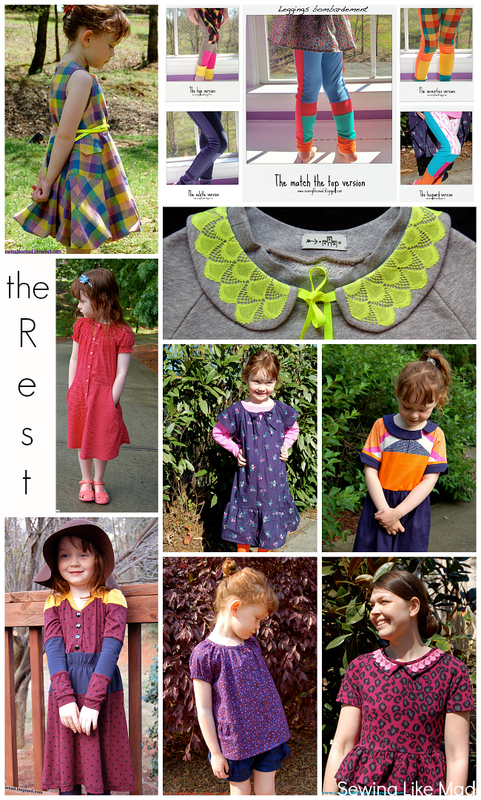 The top left photo is the Darling Daisy Dress from Sew Like my Mama. 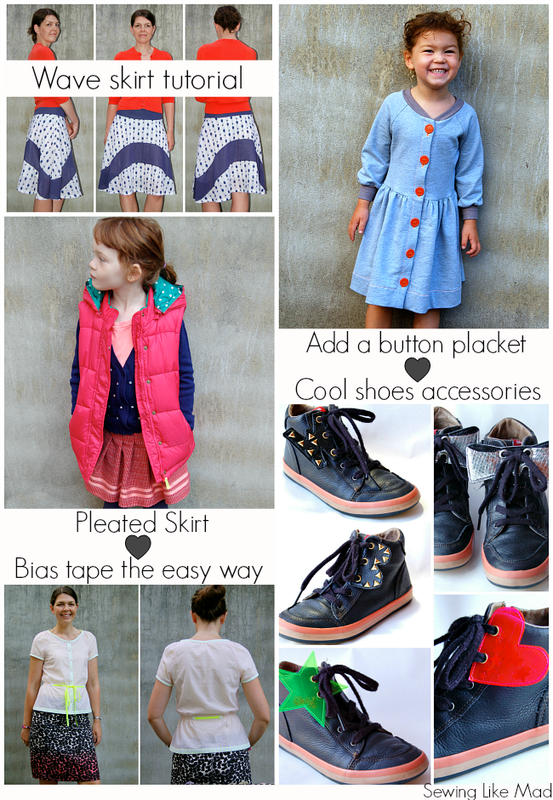 Below that dress The Ruffle Top and the Bubble Pocket Shorts both by E&E Patterns. The middle dress in the bottom row is the Hanimi Dress by Straight Grain. HERE is the link to all the testing posts. And HERE is the link to the tour/reviews. And last some of the posts that does not fit into the above categories. The collage has the title 'the rest'....the proper title would have been 'a bit of the rest', ha. I tried, and instantly got obsessed with, Japanese Pattern Books - even though the fun of figuring it out is going away now that they are being translated to English. HERE is the link to my Japanese Pattern posts. I still need to try to sew something to myself from a Japanese pattern. In 2014 maybe? Bottom row: My Inner Grandma jersey dress, Peplum sweatshirt top. And I promised to give a few hints on the direction of this blog for 2014. Okay, so my plan is (and let's see on my 2014 recap how that holds up) is to probably have fewer posts. The posts will be a mix of lighter one that will just show an item I have sewed for me or the kids and heavier posts with tutorials of different kinds. I still hope to be invited to series, testing and tours but there will be fewer posts with such kind next year....and not because I don't enjoy making them but simply because I don't have time for it all. In 2013 did me and nine other ladies also introduce Willow & Co. You will for sure see more to that project in 2014. You can sign up for the newsletter HERE and you will be the first to know more. And do you know we have a blog? You can read all our introductions HERE. Happy happy New Year and thank you for all the support and sweet comments you have showed me the last year. Wow! You really did a lot this year and I'm amazed at all the excellent work you got accomplished! You really had an amazing year Mie! Like two years packed into one! I think you need a nice vacation on a Mexican beach with some margaritas and a book. I feel the same way. Myself, I'm so exhausted after such a productive year. I'm looking forward to just slowing down a little. Happy new year! Damn, Mie - you've been busy. You are so talented and inspiring!!! Can't wait to see more. What a busy and productive year you had .... and everything looks so nice! I've so enjoyed seeing your work pop up everywhere this year! Your style is fun and whimsical. Have a wonderful 2014! Wow! You've done sooooo much this year and it all looks so immaculately sewn. I'm so pleased I met you in 2013 and can't wait to see what you do in 2014. My goodness. I knew you were involved in lots of fun things but that is a crazy amount of sewing! Enjoy the slower pace of 2014!